Prostitution was a risque subject for Victorian painters, despite there being upwards of 80,000 prostitutes in London alone. There were three attitudes towards prostitution – condemnation, regulation, and reformation. Dickens adopted the last and was intimately involved in a house of reform called Urania Cottage. girls" looking for a suitable setting. 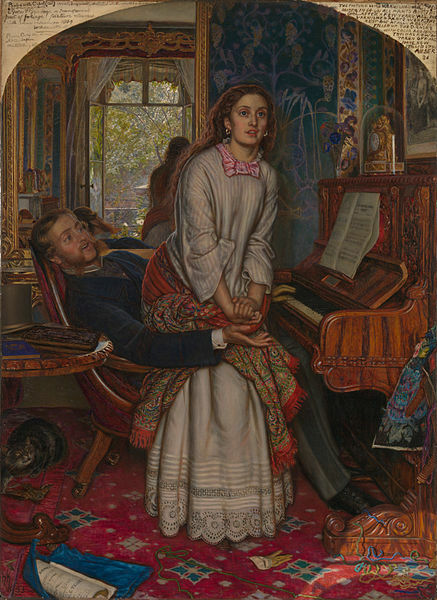 He did not plan to recreate any particular scene from David Copperfield; he initially wanted to capture something more general: "the loving seeker of the fallen girl coming upon the object of his search", but he reconsidered, deciding that such a meeting would engender different emotions in the girl than the repentance he wanted to show. He eventually settled on the idea that the girl's companion could be singing a song that suddenly reminded her of her former life and thereby act as the unknowing catalyst for her epiphany. 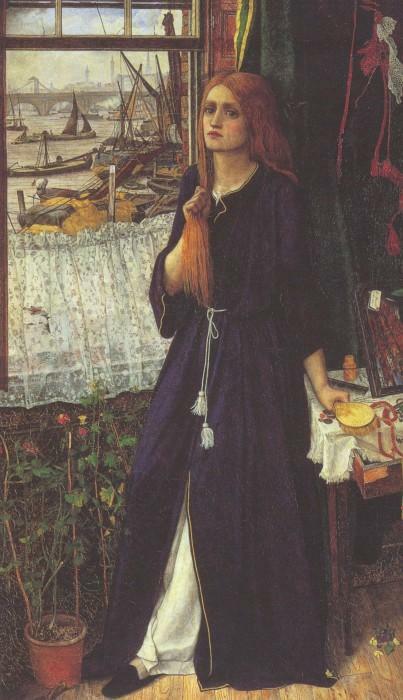 The model for the girl was Annie Miller, who sat for many of the Pre-Raphaelites and to whom Hunt was engaged until 1859. Hunt also seems to have had in mind Thomas Hood's then famous poem The Bridge of Sighs of 1844, also perhaps the basis of G F Watt's Found Drowned of about 1850. The poem inspired a number of paintings and a etching by Millais. But back to Awakening. 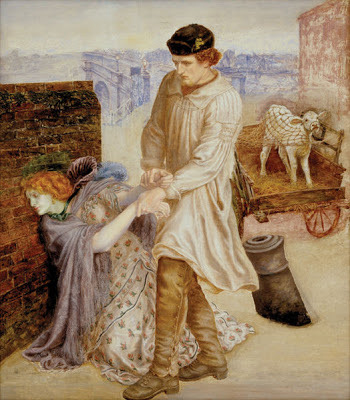 Rossetti's only contemporary moral subject, Found was never completed, and he had tremendous trouble with it. 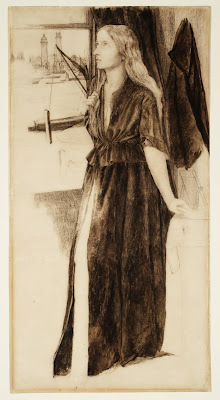 Fanny was the final model though earlier studies seem to be of a maid Ellen Frazer. 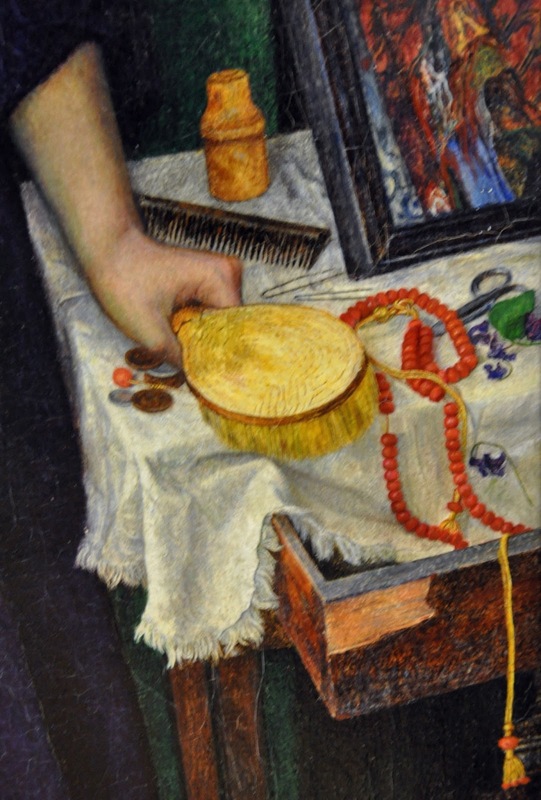 John Roddam Spencer Stanhope was painted in 1858-9 in the studio above Rossetti's in Blackfriars (he had worked on the Oxford murals). He was believed to be inspired by the two other paintings and used Fanny as the model, though oddly the finished picture more closely resembles Lizzie. The view out the window is looking up the Thames to Waterloo bride. Like Hunts picture the room is full of symbols of her poverty like the few coins on the table, perhaps a payment from a client.